http://www.leg.state.vt.us/jfo/reports/Legislative%20Briefings/2011_11_10_Miller_Vermont%20Energy%20Future.pdf. For info contact Kathy Blume, kablume@gmail.com, 802-233-5856. Rep. Yantachka will also be hosting the Live@5:25 Chittenden County Democrats Show on Burlington's public access TV station CCTV Channel 17 on Monday December 5th at 5:25 PM. His guest will be Department of Public Service Commissioner Liz Miller and the topic will be the CEP. This call-in program can be streamed live at http://www.cctv​.org/watch-tv/l​ive-at-525. 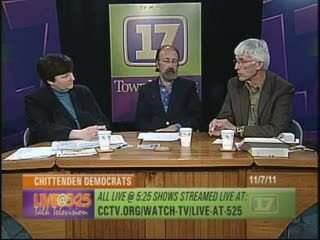 Vermont State Treasurer, Beth Pearce, recently appeared on the Chittenden County Democrats show on Burlington's public access TV, Channel 17, with Bob Hooper, Chair of the Chittenden County Democratic Committee, and Rep. Mike Yantachka (Chitt 1-2). The segment can be viewed at http://www.cctv.org/watch-tv/programs/beth-pearce-vermont-state-treasurer. Hooper started the discussion by commenting that the state pension funds seem to be in good hands. Treasurer Pearce described the status of the state's pension funds to be growing over the past two fiscal years despite the poor economic conditions. They earned an interest rate of 18 and 20 percent in 2010 and 2011 respectively. This fiscal year, which started on July 1st, has proven to be more volatile, but Vermont's pension funds are expected to be in the top five performing state pension funds in the nation. Another topic that was addressed was the missing property database managed by the State Treasurer's office. this database lists individuals and organizations that have been identified as having unclaimed property, either cash or objects, that have been turned over to the state. These may be closed bank accounts, uncashed checks, or abandoned safe deposit boxes, for example, for which the owners could not be found. Recently, additional proceeds from the John Hancock Life Insurance Company were identified as a result of a state audit, and the Treasurer's office has initiated an ad campaign urging people to check the website to see if their name appears. Some states have reciprocal agreements, so newcomers to Vermont may find money that they have coming from when they lived in another state. The Treasurer's office also sponsors a program called MoneySmart which helps parents talk about money to their kids to encourage good money habits. Finally, Treasurer Pearce talked about the challenge facing lawmakers in the upcoming session to balance the budget in the face of repairing the damage caused by hurricane Irene.